Paul Sherry Conversion Vans is proud to offer a full line-up of wheelchair vans for sale. Those with unique mobility needs know that finding a vehicle that can take them from place to place with plenty of room can be a challenge. 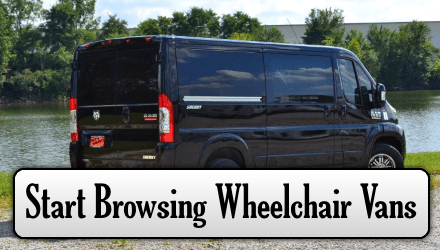 Luckily, the RAM ProMaster is one of the few vans on the market that can be configured to transport a wheelchair easily, and it is available right in Piqua at Paul Sherry Conversion Vans. Compared to other options, the RAM ProMaster not only gets you around despite any mobility impairments but also does so with ease. The lower step height compared to other vehicles makes it much easier to get inside for those who still have some lower body mobility. The lower step-in height also means that your wheelchair doesn’t have to be lifted as high, reducing the amount of time and effort it takes to get it into place. Compared to other wheelchair vans for sale, the RAM ProMaster also features a taller ceiling than the average van, something that can be greatly appreciated. Those who are helping others get situated within the van don’t have to worry about accidentally hitting their heads on the ceiling while doing so, giving you one less thing to worry about. In fact, the interior height is a full 6 feet 4 inches. This particular vehicle at Paul Sherry Conversion Vans is also special in that it can work with any type of wheelchair lift. That means that if you have specific preference, you won’t have to compromise on this front. It also allows you to choose whichever mobility lift is most comfortable for you to use and works best with your particular type of wheelchair. While many mobility vans only provide access on the side of the vehicle, the RAM ProMaster wheelchair van also has a rear door that opens up completely. This way, you can install a lift on the side or in the back, or even in both locations. This range of options ensures that there is always room to get in and out of the vehicle. For example, if you can’t find a handicapped parking spot, the rear lift would allow you to get the wheelchair in and out anyway; this can also help for those whose homes have smaller parking spaces. 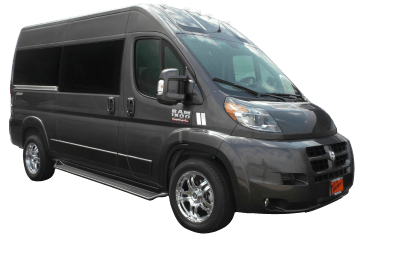 When you look at the RAM ProMaster and other wheelchair vans for sale, it offers many of the same features but at a significantly lower price. The Mercedes-Benz Sprinter, for example, is another popular option, but its luxury brand means that it costs more initially. The RAM ProMaster also tends to have lower maintenance costs. In addition to the advantages like a tall interior height mentioned above, the RAM ProMaster Van also gets great fuel economy of over 20 mpg. The turning radius is only 36 feet, a great figure for a vehicle of its size, so you can make maneuvers without worrying about hitting objects around you. There is also plenty of sound insulation and a luxurious feel inside the vehicle. In fact, the RAM ProMaster has best-in-class figures for interior height, turning radius, and fuel economy. It runs on a 3.6-liter Pentastar V6 engine and has front-wheel drive. The RAM ProMaster can even tow as much as 3,100 pounds and includes a 32-inch LED-LCD HDTV. If you just can’t find the right wheelchair van for sale, the RAM ProMaster van will always meet your needs. After all, they start with the chassis from the RAM ProMaster, and then we add our Sherry Conversion Package. This throws in a luxurious finish and passenger seating. We also work closely with you as the buyer to make sure that you have the exact interior equipment for your needs. We can create a custom floorplan that fits almost any mobility equipment, whether it is a lift, transfer seat, EZ Lock docking system, or hand control. Our experience in the industry means that we know exactly how to arrange the wheelchair van for your needs. To help with affordability, it is possible to get a new or used RAM ProMaster wheelchair van. The vehicles available at Paul Sherry Conversion Vans are typically new, but you we also frequently have used models on the lot. This way, you can save a bit of money initially. Since the RAM ProMaster is highly durable and reliable, even a used model should get the job done easily. At Paul Sherry Conversion Vans, we do more than just sell conversion vans with mobility access; we also buy them. This means that if you have decided it is time to upgrade your vehicle, you can trade in your old one for a fair price, giving you a reasonable amount off your purchase. Because we accept trade-ins and buy used wheelchair vans for sale, we typically have at least a few used models on the lot at any given moment. Since your mobility is so important, our team at Paul Sherry Conversion Vans does everything we can to ensure you can afford a RAM ProMaster. Our financing department has experience working with all credit scores, including people with no credit. You can either apply in person at our dealership or fill out the online finance application and wait for our team to contact you. Your information is safe with us, and we won’t do anything that hurts your credit score. In fact, we won’t take any action at all without your permission. 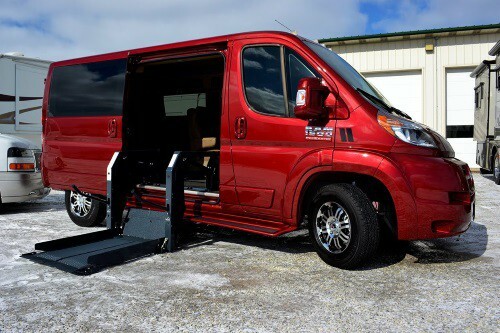 Since options for wheelchair vans are somewhat limited across the country, Paul Sherry Conversion Vans does our part to make it easier to get one. Part of this is offering delivery to all 50 states in the country. This way, even if you live in an area without a wheelchair van nearby and have special mobility needs, you can own a vehicle that will accommodate you and your wheelchair. Just check out our online inventory or give us a call. For those who live in the area, our dealership is conveniently located just 20 minutes to the north of the I-70 and I-75 interchange in Piqua, Ohio. Visit us to get a better idea of how a RAM ProMaster wheelchair van can help you get around.